Trustees elected Duke McCall as president in 1951. During his 31-year presidency, he led the seminary through remarkable growth. Enrollment tripled, from 1,009 in 1951 to 3,201 in 1982. Faculty and degree programs expanded. He oversaw the construction of the Boyce Centennial Library in 1959. He also led the seminary through some wrenching controversies. Most of the faculty agreed broadly with a modernist or neo-orthodox approach to Scripture, but they held at the same time that the Bible was vital to spiritual life and that Jesus was at work in the world. McCall sympathized with their views to some degree and supported a cautious historical-critical approach to the Bible. At the same time, McCall was convinced that since Southern Baptists had established the seminary, endowed it, and gave substantial financial support annually, they had an incontrovertible right to expect that the seminary faculty would teach the Scriptures in the manner that the churches approved, in accordance with the Abstract of Principles. When some faculty began to agitate to teach modernist views more openly and aggressively, McCall urged them to respect the views of the churches whom the seminary served. A faction of 13 professors issued an ultimatum to trustees to fire McCall. After careful investigation, trustees voted to dismiss the thirteen in May 1958. One, J. J. Owens, gained reinstatement. McCall sought throughout his tenure to balance respect for the scholarship of the faculty with the rights and expectations of Southern Baptist churches. The denomination’s right to determine the seminary’s doctrinal commitments, however, was a settled matter for him. Southern Seminary belonged to Southern Baptists. 1951 Duke K. McCall Becomes the seminary’s seventh president. 1958 Trustees dismiss 13 faculty members. 1959 James P. Boyce Centennial Library is completed. 1961 Martin Luther King Jr. delivers Julius Brown Gay lecture. 1963 Carver School of Missions and Church Social Work becomes part of the seminary. 1974 Boyce Bible School opens to provide theological education for ministers without college degrees. On April 19, 1961, Dr. Martin Luther King Jr., at the invitation of the seminary faculty, delivered the Julius Brown Gay Lecture in Alumni Chapel. 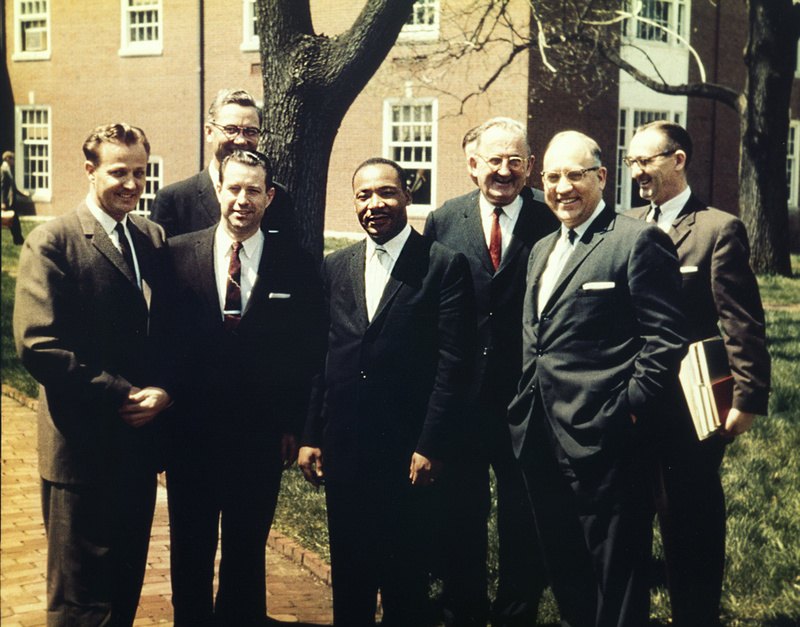 In his lecture on “The Church on the Frontier of Racial Tension,” King challenged the 1,400 listeners to lead Southern Baptist churches to help end segregation. They should teach clearly the equality of all races and the destructive character of racial segregation. King spoke afterward to a large group of students and privately to the faculty. When King met with Louisville’s mayor later that day, he presented a petition signed by more than 200 seminary students urging the desegregation of Louisville’s businesses. The seminary provoked considerable controversy for inviting King to the lectureship, and many churches demanded McCall’s resignation and withdrew their financial support. Southern Baptist leaders defended the seminary for inviting King. The seminary community faced a collective challenge on April 3, 1974, when a tornado struck the campus and nearby neighborhoods. The tornado was one of 148 over 13 states in what was one of the largest and most violent tornado outbreaks in U.S. history. The storms resulted in 315 deaths, over 6,000 injuries, and $3.5 billion in damage. The tornado that hit the Southern campus severely damaged the columns, front porch, roof, and cupola of Fuller Hall, as well as the cupola of Mullins Hall. It also downed a thousand trees on campus and damaged the houses of a half dozen professors. The campus had no heat or light for 10 days and the seminary had to suspend classes for 18 days. Estimated damage to Southern was around $1 million. The communities north of the seminary experienced severe damaged and seminary students mobilized to provide aid. Until his retirement in 1982, McCall mediated the uneasy discourse between Southern Baptists’ commitment to traditional orthodoxy and the faculty’s commitment to modern theology.